Miss Katy-did sat on the branch of a flowering azalea, in her best suit of fine green and silver, with wings of point-lace from Mother Nature's finest web. Miss Katy was in the very highest possible spirits, because her gallant cousin, Colonel Katy-did, had looked in to make her a morning visit. It was a fine morning, too, which goes for as much among the Katy-dids as among men and women. It was, in fact, a morning that Miss Katy thought must have been made on purpose for her to enjoy herself in. There had been a patter of rain the night before, which had kept the leaves awake talking to each other till nearly morning; but by dawn the small winds had blown brisk little puffs, and whisked the heavens clear and bright with their tiny wings, as you have seen Susan clear away the cobwebs in your mamma's parlour; and so now there were only left a thousand blinking, burning water-drops, hanging like convex mirrors at the end of each leaf, and Miss Katy admired herself in each one. "Certainly I am a pretty creature," she said to herself; and when the gallant colonel said something about being dazzled by her beauty, she only tossed her head and took it as quite a matter of course. "The fact is, my dear colonel," she said, "I am thinking of giving a party, and you must help me to make out the lists." "My dear, you make me the happiest of Katy-dids." "Now," said Miss Katy-did, drawing an azalea-leaf towards her, "let us see--whom shall we have? The Fireflies, of course; everybody wants them, they are so brilliant,--a little unsteady, to be sure, but quite in the higher circles." "Yes, we must have the Fireflies," echoed the colonel. "Well, then, and the Butterflies and the Moths. Now, there's a trouble. There's such an everlasting tribe of those Moths; and if you invite dull people they're always sure all to come, every one of them. Still, if you have the Butterflies, you can't leave out the Moths." "Old Mrs. Moth has been laid up lately with a gastric fever, and that may keep two or three of the Misses Moth at home," said the colonel. "Whatever could give the old lady such a turn?" said Miss Katy. "I thought she never was sick." "I suspect it's high living. I understand she and her family ate up a whole ermine cape last month, and it disagreed with them." "For my part, I can't conceive how the Moths can live as they do," said Miss Katy, with a face of disgust. "Why, I could no more eat worsted and fur, as they do--"
"That is quite evident from the fairy-like delicacy of your appearance," said the colonel. "One can see that nothing so gross or material has ever entered into your system." "I'm sure," said Miss Katy, "mamma says she don't know what does keep me alive; half a dewdrop and a little bit of the nicest part of a rose-leaf, I assure you, often last me for a day. But we are forgetting our list. Let's see--the Fireflies, Butterflies, Moths. The Bees must come, I suppose." "The Bees are a worthy family," said the colonel. "Worthy enough, but dreadfully humdrum," said Miss Katy. "They never talk about anything but honey and housekeeping; still, they are a class of people one cannot neglect." "Well, then, there are the Bumble-Bees." "Oh, I dote on them! General Bumble is one of the most dashing, brilliant fellows of the day." "I think he is shockingly corpulent," said Colonel Katy-did, not at all pleased to hear him praised; "don't you?" "I don't know but he IS a little stout," said Miss Katy; "but so distinguished and elegant in his manners--something quite martial and breezy about him." "Well, if you invite the Bumble-Bees, you must have the Hornets." "Those spiteful Hornets! I detest them!" "Nevertheless, dear Miss Katy, one does not like to offend the Hornets." "No, one can't. There are those five Misses Hornet--dreadful old maids!--as full of spite as they can live. You may be sure they will every one come, and be looking about to make spiteful remarks. Put down the Hornets, though." "How about the Mosquitoes!" said the colonel. "Those horrid Mosquitoes--they are dreadfully plebeian! Can't one cut them?" "Well dear Miss Katy," said the colonel, "if you ask my candid opinion as a friend, I should say not. There's young Mosquito, who graduated last year, has gone into literature, and is connected with some of our leading papers, and they say he carries the sharpest pen of all the writers. It won't do to offend him." "And so I suppose we must have his old aunts, and all six of his sisters, and all his dreadfully common relations." "It is a pity," said the colonel; "but one must pay one's tax to society." 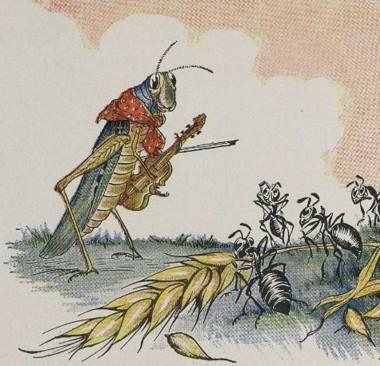 Just at this moment the conference was interrupted by a visitor, Miss Keziah Cricket, who came in with her work-bag on her arm to ask a subscription for a poor family of Ants who had just had their house hoed up in clearing the garden-walks. "How stupid of them," said Katy, "not to know better than to put their house in the garden-walk; that's just like those Ants." "Well, they are in great trouble; all their stores destroyed, and their father killed--cut quite in two by a hoe." "How very shocking! I don't like to hear of such disagreeable things; it affects my nerves terribly. Well, I'm sure I haven't anything to give. Mamma said yesterday she was sure she didn't know how our bills were to be paid; and there's my green satin with point- lace yet to come home." And Miss Katy-did shrugged her shoulders and affected to be very busy with Colonel Katy-did, in just the way that young ladies sometimes do when they wish to signify to visitors that they had better leave. Little Miss Cricket perceived how the case stood, and so hopped briskly off, without giving herself even time to be offended. "Poor extravagant little thing!" said she to herself, "it was hardly worth while to ask her." "Pray, shall you invite the Crickets?" said Colonel Katy-did. "Who? I? Why, colonel, what a question! Invite the Crickets? Of what can you be thinking?" "And shall you not ask the Locusts, and the Grasshoppers?" "Certainly. The Locusts, of course,--a very old and distinguished family; and the Grasshoppers are pretty well, and ought to be asked. But we must draw a line somewhere,--and the Crickets! why, it's shocking even to think of!" "I thought they were nice, respectable people." "Oh, perfectly nice and respectable,--very good people, in fact, so far as that goes. But then you must see the difficulty." "My dear cousin, I am afraid you must explain." "Why, their COLOUR, to be sure. Don't you see?" "Oh!" said the colonel. "That's it, is it? Excuse me, but I have been living in France, where these distinctions are wholly unknown, and I have not yet got myself in the train of fashionable ideas here." "Well, then, let me teach you," said Miss Katy. "You know we republicans go for no distinctions except those created by Nature herself, and we found our rank upon COLOUR, because that is clearly a thing that none has any hand in but our Maker. You see?" "Yes; but who decides what colour shall be the reigning colour?" "I'm surprised to hear the question! The only true colour--the only proper one--is OUR colour, to be sure. A lovely pea-green is the precise shade on which to found aristocratic distinction. But then we are liberal;--we associate with the Moths, who are gray; with the Butterflies, who are blue-and-gold coloured; with the Grasshoppers, yellow and brown; and society would become dreadfully mixed if it were not fortunately ordered that the Crickets are black as jet. The fact is, that a class to be looked down upon is necessary to all elegant society; and if the Crickets were not black, we could not keep them down, because, as everybody knows, they are often a great deal cleverer than we are. They have a vast talent for music and dancing; they are very quick at learning, and would be getting to the very top of the ladder if we once allowed them to climb. But their being black is a convenience; because, as long as we are green and they black, we have a superiority that can never be taken from us. Don't you see now?" "Oh yes, I see exactly," said the colonel. "Now that Keziah Cricket, who just came in here, is quite a musician, and her old father plays the violin beautifully;--by the way, we might engage him for our orchestra." And so Miss Katy's ball came off, and the performers kept it up from sundown till daybreak, so that it seemed as if every leaf in the forest were alive. The Katy-dids and the Mosquitoes, and the Locusts, and a full orchestra of Crickets made the air perfectly vibrate, insomuch that old Parson Too-Whit, who was preaching a Thursday evening lecture to a very small audience, announced to his hearers that he should certainly write a discourse against dancing for the next weekly occasion. The good doctor was even with his word in the matter, and gave out some very sonorous discourses, without in the least stopping the round of gaieties kept up by these dissipated Katy-dids, which ran on, night after night, till the celebrated Jack Frost epidemic, which occurred somewhere about the first of September. Poor Miss Katy, with her flimsy green satin and point-lace, was one of the first victims, and fell from the bough in company with a sad shower of last year's leaves. The worthy Cricket family, however, avoided Jack Frost by emigrating in time to the chimney-corner of a nice little cottage that had been built in the wood that summer. There good old Mr. and Mrs. Cricket, with sprightly Miss Keziah and her brothers and sisters, found a warm and welcome home; and when the storm howled without, and lashed the poor naked trees, the Crickets on the warm hearth would chirp out cheery welcome to papa as he came in from the snowy path, or mamma as she sat at her work-basket. "Cheep, cheep, cheep!" little Freddy would say. "Mamma, who is it says 'cheep'?" "Dear Freddy, it's our own dear little cricket, who loves us and comes to sing to us when the snow is on the ground." So when poor Miss Katy-did's satin and lace were all swept away, the warm home-talents of the Crickets made for them a welcome refuge. You may also enjoy John Keats' poem, On The Grasshopper and Cricket. Add Miss Katy-Did and Miss Cricket to your own personal library.